Larger and more luxurious than the average midsize family sedan, the Hyundai Azera slots between the Sonata and Genesis sedan in Hyundai's lineup. It provides impressive interior room, features and power for a price that's thousands less than many competing vehicles. Buyers who have owned a domestic full-size sedan in the past and are looking for a new vehicle will want to check out the Hyundai Azera. It prioritizes comfort, luxury, safety and value, and is well-suited both for commuting and long-distance trips. The Azera is also an appealing alternative to entry-level models from Japanese luxury brands. The Hyundai Azera adds power and efficiency to a model known for its luxurious appointments. The updated large sedan now includes an advanced six-speed automatic transmission and other powertrain refinements raising the bar on fuel economy in its class, while still gaining horsepower. The Grandeur TG is a full-size sedan introduced for the 2006 model year. A redesigned XG350, it shares a platform with the Sonata. 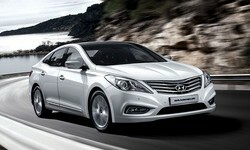 It is sold as the Hyundai Azera in North America, Taiwan, Saudi Arabia, Kuwait, and the United Arab Emirates. The Azera had been the most expensive Hyundai model outside of Korea, China, and the Middle East — until the 2008 introduction of the Genesis. The Grandeur XG was a mid-size luxury car. In some other markets, namely North America, it was called the Hyundai XG. The first two generations were essentially rebadged Mitsubishi Debonairs, with the third generations developed entirely by Hyundai, with technical experience learned from the first two generations. It shared a platform and engines with the Kia Opirus (Amanti in North America). The New Grandeur and the third generation of the Mitsubishi Debonair were the products of a joint development between Hyundai and Mitsubishi Motors. Mitsubishi was responsible for the powertrain, and Hyundai was responsible for the body and trim design. Production of the car began in September 1992 and ended in 1998. The first Grandeur was a rebadged Mitsubishi Debonair produced by Hyundai. Initially launched with Mitsubishi-sourced 2.0L SOHC MPI version of the engine used in the first generation Sonata, a 2.4 L SOHC MPI engine was added in 1987. A V6 3.0 L engined model was launched in 1991 to better compete with the Daewoo Imperial.